Presenting the 10-month performance report of the Federal Ethics & Anti-Corruption Commission (FEACC) to the Parliament on Tuesday, May 14, 2013, Commissioner Ali Suleiman (left) said the Commission received over three thousand tips off and appeals within the last ten months. Presenting the 10-month performance report of the Federal Ethics & Anti-Corruption Commission (FEACC) to the Parliament on Tuesday, May 14, 2013, Commissioner Ali Suleiman (left) said the Commission received over three thousand tips off and appeals within the last ten months. He also said the capacity of the institution before the court of law has reached 87pc for all filed cases and 100pc for cases related to property. The Commissioner said that the FEACC has finalized the probes it has been undertaking into possible serious offenses related to land administration, taxation, public procurement and justice administration. 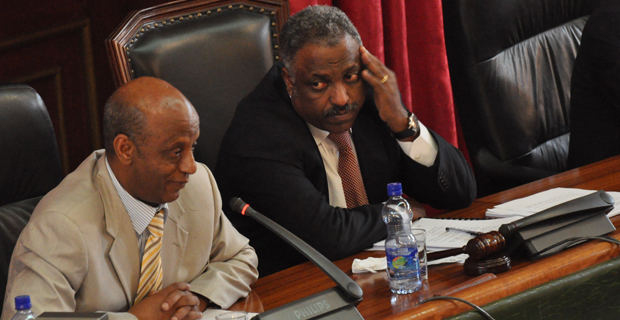 Aba Dula Gemeda, right, speaker of the House facilitated the session.